My current set up has three Tama toms, Tama bass, Tama Snare, Pearl bass, Pearl floor tom, and an occaisional Ludwig snare. R to the Core, baby. Here we go I have a 14 inch metal Jap snare that I fixed and dont use because I just bought a 12x7 Mapex Pro M maple snare just before christmas. I also retired my 50 year old 14 inch Slingerland snare. My toms are a 13 and 16 inch slingerlands my bass is a 22 inch Yamaha. I have a sonor hi hat stand, snare stand and boom stand, lp claw, Pdp hideaway boom, and a gibralter boom stand some old snare stand I use to mount my 13 inch tom. Iron cobra pedals and my cymbals are a mix of Zildjian, Sabian and Saluda. 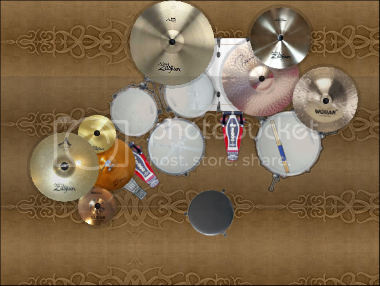 I have a pearl throne (ugh terrible) The only things that match are my pro marks and all my drums have Evans heads on them. Oh and I use Danmar wood beaters haha!